This foundation was raved about by one of my favorite Youtubers, Pixi2woo, so I knew I had to give it a try. Its a creme foundation, so it has a thick, but very smooth texture. It blends easily into the skin with a brush or your fingers and has medium to full, buildable coverage. 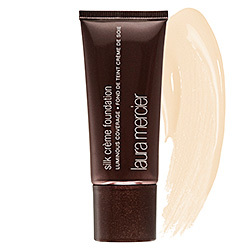 This foundation is great for knocking out redness and creating a very evened out complexion, but you will need concealer to tackle stubborn blemishes. I have worn this product twice and both times it stayed on nicely throughout the day and seemed to combat oiliness, especially with a setting powder. Interestingly, it is also very moisturizing, so you would think it would create shine but I have not found that to be the case. This quality makes it great for all skin types. On Sephora's website the description says that this product adds luminosity to the skin; but I find that the finish is more matte- natural, but matte. This foundation has a very subtle scent to it, so it shouldn't be bothersome for people that are sensitive to strong smells. One downside to this product is the shade range. The range is not terrible, but I have seen foundations with 2-3 times as many color options. Luckily, the color that I am sampling now is a really great match for my skin. It's important to take home a sample and look at the color in various light before purchasing. The color may look like it matches in the store, but may look completely different in broad daylight. Sephora is great about giving samples, so don't hesitate to ask! Another downside is that this product can look and feel heavy on the skin if you apply too much because of its thick consistency. A tiny bit goes a very long way because it is so pigmented so its easy to over do it. Start with a small amount, and then build up as needed so as not to look cakey. Obviously the price always has to be listed as a downside- $43. This is pricey, but it will last you absolutely AGES if you decide to purchases because of the itty bitty amount that you need per application. Overall, I give this foundation a thumbs up. It has solid coverage and doesn't make my skin shiny. I also think it could work for pretty much any skin type. Have you tried this foundation? If so, I'd love to know what you think! Check out the video to see it applied!